29th October 1984 - Arthur Baker Remix (+ 12") 29th October 1984 - 12" "Mole Mix"
Detail : Paul's thirty-fourth single. Band included, Herbie Flowers, Stuart Elliot, Ann Dudley, David Gilmour, Eric Stewart and Linda. 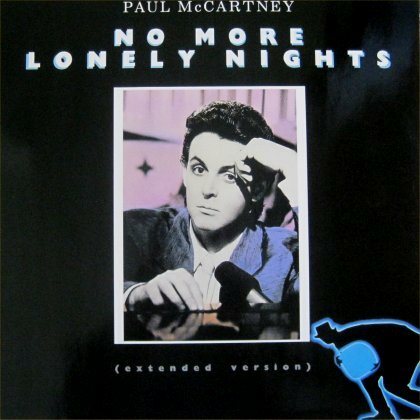 1) The original 7" version - No More Lonely Nights (Ballad) b/w No More Lonely Nights (Playout Version). 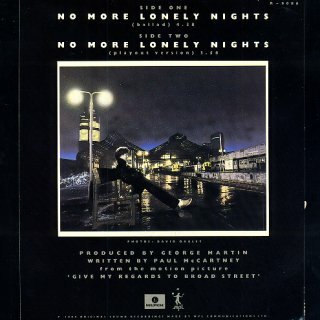 2) same 7" version, BUT spelt No More Lonley Nights on both sides (pictured below). 4) Same 12" recordings on a picture disc. 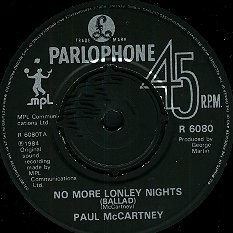 5) 7" - No More Lonely Nights (Ballad) b/w No More Lonely Nights (Arthur Baker's Dance mix). 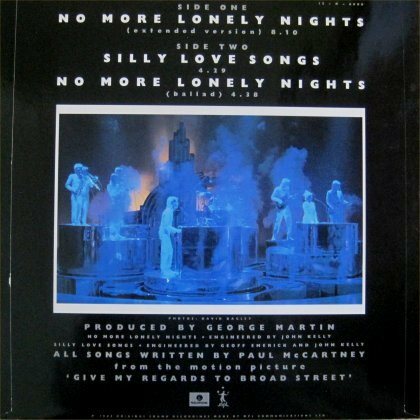 7) 12" - No More Lonely Nights (Mole Mix). ... a single-sided 12" "Mole Mix" was pressed up for D.J. 's which was limited to 300 copies, individually numbered. Therefore this is quite collectable and can be on sale for up to £200 ! The original video was shot on April 10th in Bermondsey (South East London) at the Old Justice Pub. A second video was shot in October at the Hippodrome in London to promote the Dance Version, this clip features Jeffrey Daniels. The single and 12" versions were released in picture sleeves with photographs by David Dagley. The original 7" can be seen at the top, with the only change for the 12", being the picture on the rear of Paul on a bench, replaced by a group picture performing live (also as above). The picture disc 12", had the same as the cover of the 7" as it's A-side picture, but the B-side picture was a different group picture, part of which can be seen above. This picture was taken by Terry O'Neil. 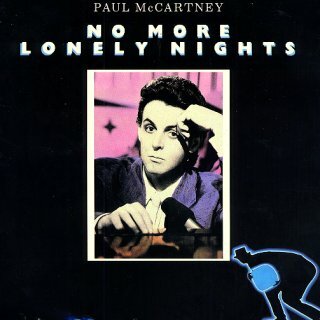 No More Lonely Nights - Showing spelling error !